Today, cardiovascular diseases, obesity, cancer and diabetes are responsible for 35 million deaths a year worldwide. In Europe, these chronic non-infectious diseases represent the 70% of all deaths, and it is estimated that this number will increase to 80% by the year 2030. Nevertheless, not all of us have the same risk to suffer these diseases, neither all of us have the same reaction to poor nutrition, because this response is modulated by the individual genetics. The presence of a particular gene or mutation in most cases merely connotes a predisposition to a particular disease process. Whether that genetic potential will eventually manifest as a disease depends on a complex interplay between the human genome and environmental and behavioural factors. Nutrigenomics initially referred to the study of the effects of nutrients on the expression of an individual’s genetic makeup. More recently, this definition has been broadened to encompass nutritional factors that protect the genome from damage. 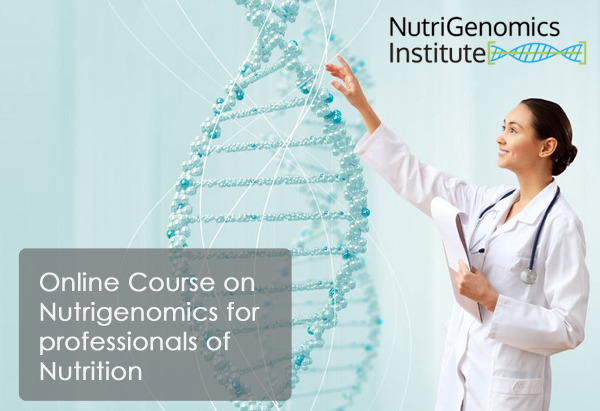 This course provides practitioners with an in-depth training in nutrigenetic science. After this course, you will understand the information included on genetic tests and will be able to translate it into nutritional recommendations for your patients. The online course on Nutrigenomics for Health Professionals is especially designed for dietitians-nutritionists in search of personalised diets, endocrinologists, pharmacists and students of Health Sciences. Our online learning courses have been recorded using the latest video technologies. Our courses provide in-depth training in Nutrigenomics at a more affordable price than other online courses which cover less subjects. Online learning gives you the flexibility we all need in these busy times. You can access the course whenever you want. It´s available 24/7. You just need to log in on the page and continue where you finished last time. We also provide 500 pages of downloadable support material in pdf format. You have 120 calendar days from the date of receiving the log-in details to access the course and finish it. The total estimated duration of the course is 25 hours. At the end of the course and after passing the self-assessment tests for each subject, you will obtain a certificate awarded by the NutriGenomics Institute. This course is the exclusive property of the NutriGenomics Institute, recognising the ownership of intellectual property to the authors of the same for all legal purposes. 6. Behaviour, Genes and Nutrition. 7. Human Evolution and Nutrition. 8. Metagenomics: The Microbiome and Nutrition. 9. Nutrigenomics of complex disease. 12. Implementation of Nutrigenomics in the practice. The study of the interaction between nutrition and genes is what defines The Nutrigenomics. The role of nutrition professionals in the maintenance of human health in the coming years will be the key, as well as the need for training through our courses in Nutrigenomics and Nutrigenetics. Throughout the Nutrigenomics online course for professionals in Nutrition, you will know the tools that will soon be the most common in the dietitian and nutritionist medical consultation. You will understand how individual genetic affects the response to nutrients. And also it will let you know how Nutrigenomics helps design and optimize the nutrition based on individual genome information of each patient. The Nutrigenomics online course for professionals in Nutrition is particularly aimed at dieticians- nutritionists who they are in search of personalized diets, endocrinologists, pharmacists and students of Health Sciences. The online distance courses in Nutrigenomics and Nutrigenetics have been recorded using the latest video technologies. Our courses provide a depth training in Nutrigenomics and they are more affordable than a master degree. The methodology is based on a distance education, flexible and from your home you can watch the videos of the modules with freedom of schedules. The modules also have over 500 pages of downloadable support material in pdf format. You have 120 calendar days from the date we send you the keys to access the online course in the virtual campus to finish it. You can access the online course 24 hours a day from Monday to Sunday. The estimated total duration of the course is 20 hours. After completing the course and after passing the self-assessment tests for each topic you will get a diploma from the Nutrigenomics Institute. If you want more information please fill the form below and one member from our team will contact you shortly.